It's an honor and a pleasure to have one's work replicated, especially when it's done as carefully as Philipp Schoenegger and Johannes Wagner have done. In 2009, Joshua Rust and I surveyed the attitudes and behavior of ethicist philosophers in five U.S. states, comparing those attitudes and behavior to non-ethicist philosophers' and to a comparison group of other professors at the same universities. Across nine different moral issues, we found that ethicists reported behaving overall no morally differently than the other two groups, though on some issues, especially vegetarianism and charitable giving, they endorsed more stringent attitudes. (In some cases, we also had observational behavioral data that didn't depend on self-report. Here too we found no overall difference.) Schoenegger and Wagner translated our questionnaire into German and added a few new questions, then distributed it by email to professors in German-speaking countries, achieving an overall response rate of 29.5% [corrected Mar 23]. (Josh and I had a response rate of 58%.) With a couple of exceptions, Schoenegger and Wagner report similar results. The most interesting difference between Schoenegger and Wagner's results and Josh's and my results concerns vegetarianism. We originally asked three questions about vegetarianism. In the first part of the questionnaire, we asked respondents to rate "regularly eating the meat of mammals, such as beef or pork" on a nine-point scale from "very morally bad" to "very morally good", with "morally neutral" in the middle. 17. During about how many meals or snacks per week do you eat the meat of mammals such as beef or pork? 18. Think back on your last evening meal, not including snacks. Did you eat the meat of a mammal during that meal? On the attitude question, 60% of ethicist respondents rated meat-eating somewhere on the "bad" side of the nine-point scale, compared to 45% of non-ethicist philosophers and only 19% of professors from other departments (ANOVA, F = 17.0, p < 0.001). We also found substantial differences by both gender and age, with women and younger respondents more likely to condemn meat-eating. For example, 81% of female philosophy respondents born 1960 or later rated eating the meat of mammals as morally bad, compared to 7% of male non-philosophers born before 1960. That's a huge difference in attitude! Eight percent of respondents rated it at 1 or 2 on the nine-point scale -- either "very bad" or adjacent to very bad -- including 11% of ethicists (46/564 overall, 22/193 of ethicists). On self-report of behavior, Josh and I found much less difference. On our "previous evening meal" question, we detected at best a statistically marginal difference among the three main analysis groups: 37% of ethicists reported having eaten meat at the previous evening meal, compared to 33% of non-ethicist philosophers and 45% of non-philosophers (chi-squared = 5.7, p = 0.06, excluding two respondents who answered "don’t recall"). The "meals per week" question was actually designed in part as a test of "socially desirable responding" or a tendency to fudge answers: We thought it would be difficult to accurately estimate the number, thus it would be tempting for respondents to fudge a bit. And mathematically, they did seem to be guilty of fudging: For example, 21% of respondents who reported eating meat at one meal per week also reported eating meat at the previous evening meal. Even if we assume that meat is only consumed at evening meals, the number should be closer to 14% (1/7). If we assume, more plausibly, that approximately half of all meat meals are evening meals, then the number should be closer to 7%. With that caveat in mind, on the meals-per-week question we found a mean of 4.1 for ethicists, compared to 4.6 for non-ethicist philosophers and 5.3 for non-philosophers (ANOVA [square-root transformed], F = 5.2, p = 0.006). We concluded that although a majority of U.S. ethicists, especially younger ethicists and women ethicists, thought eating meat was morally bad, they ate meat at approximately the same rate as did the non-ethicists. Schoenegger and Wagner find, similarly, a majority of German ethicist respondents rating meat-eating as bad: 67%. Evidently, a majority of U.S. and German ethicists think that eating meat is morally bad. However, among the non-ethicist professors, Schoenegger and Wagner find higher rates of condemnation of meat-eating than Josh and I found: 63% among German-speaking non-ethicist philosophers in 2018 compared to our 45% in the U.S. in 2009 (80/127 vs. 92/204, z = 3.2, p = .001), and even more strikingly 40% among German-speaking professors from departments other than philosophy in 2018 compared to only 19% in the U.S. in 2009 (52/131 vs/ 31/167, z = 4.0, p < .001; [note 1]). German professors were also much more likely than U.S. professors in 2009 to think that eating meat is very bad, with 18% rating it 1 or 2 on the scale, including 23% of ethicists (57/408 and 35/150, excluding non-respondents; two-proportion test U.S. vs German: overall z = 2.8, p = .005, ethicists z = 2.9, p = .004). 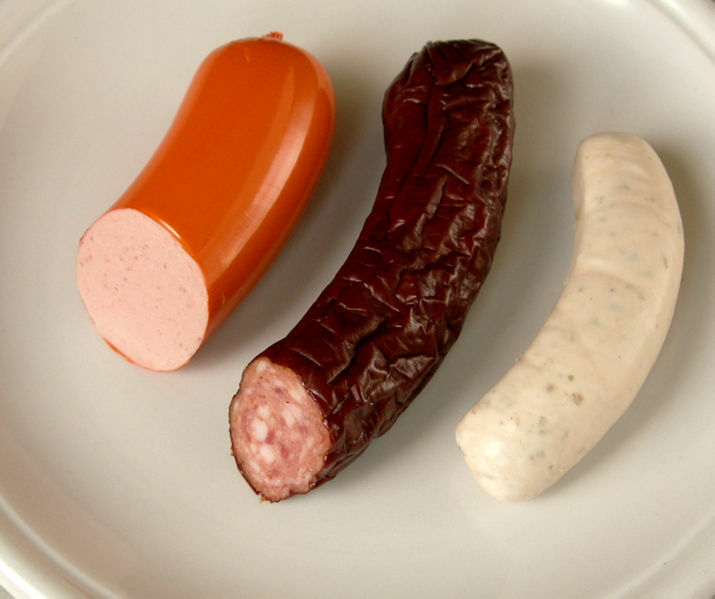 Apparently, German-speaking professors are not as fond of their wurst as cultural stereotypes might suggest! In Schoenegger and Wagner's data, ethicists report having eaten less meat at the previous evening meal than the other two groups: 25%, vs. 40% of non-ethicist philosophers and 39% of the non-philosophers (chi-squared = 9.3, p = .01 [note 2]). The meals per week data are less clear. Schoenegger report 2.1 meals per week for ethicists, compared to 2.8 and 3.0 for non-ethicist philosophers and non-philosophers respectively (ANOVA, F = 3.4, p = .03), but their data are highly right skewed, and due to skew Josh and I had used a square-root transformation for original 2009 analysis. A similar square-root transformation on Schoenegger and Wagner's raw data eliminates any statistically detectable difference (F = 0.8, p = .45). And there is again evidence of fudging in the meals-per-week responses: Among those reporting only one meat meal per week, for example, 18% reported having had meat at their previous evening meal. If we take the meals-per-week data at face value, the German respondents ate substantially less meat in 2018 than did the U.S. respondents in 2009: 2.6 meals for the Germans vs. 4.6 for the U.S. respondents (median 2 vs median 4, Mann-Whitney W = 287793, p < .001). However, the difference was not statistically detectable on the previous evening meal question: 38% U.S. vs 34% German (z = 1.3, p = .21). German professors today -- especially ethicists -- are more likely to condemn meat eating than were U.S. professors ten years ago. They might also be a bit less likely to eat meat, again perhaps especially the ethicists, though that is not entirely clear and might reflect a bit of fudging in the self-reports. The other difference Schoenegger and Wagner found was in the question of whether ethicists were on the whole more likely than other professors to embrace stringent moral views -- but full analysis of this will require some detail and will have to wait for another time. Note 1: In the published paper, Schoenegger and Wagner report 39% instead of the 40% I find in reanalyzing their raw data. This might either be a rounding error [39.69%] or some small difference in our analyses. Note 2: In the published paper, Schoenegger and Wagner report 24%, which again might be a rounding error (from 24.65%) or a small analytic difference. Should You Defer to Ethical Experts?